WittyKnits: And I guess one more. Five finished objects in just one day! The first gloves, in progress. Christmas Present - Finished! In February! Last FO of the year? And I guess one more. Those socks that are started down below. I finished them last week too. Problem is, they fit horridly. The heels sag, and they slide down into my shoes. The leg openings were huge by the end of the day. I am just going to conclude that Cascade Fixation might fall into the category of "not for me." At least not for socks. 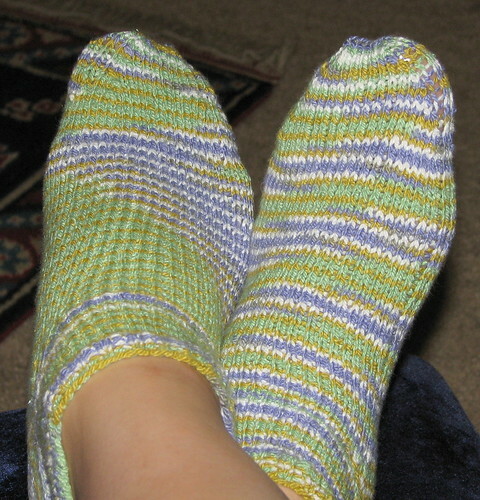 Which is sad, but I like a smaller gauge for socks anyway. Yikes, I hate it when that happens! Love the blog, found you through Swami Mami! I've had a food blog just over a year and finally plunged into the knitting blog world. Look forward to reading more, I'll link to you on my blog!